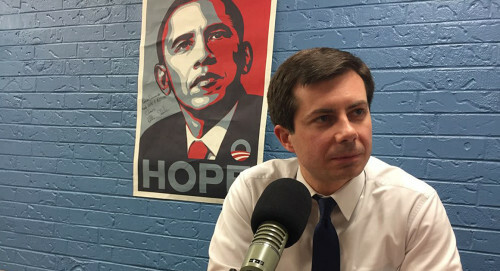 Mayor Pete Buttigieg (pronounced BOOTedgeedge apparently) is relatively young at only 37 but he has mature positive things to say. He has shown in his mayorship the ability to work with all sorts of people and be progressive in both technology and social issues. First attracted to this young and very attractive man because he is like me…ie a Gay man, there are lots of other reasons for me to support him. His politics are really not that far outside mainstream. Yes, he is a progressive, but he also is well grounded in knowing how the military and business works. In addition, his view on religion is very very very similar to me. I believe, and have for a long time, that Christianity when best understood is about inclusion and equality. If anything can be said about its proper political position, it is a sort of counter-cultural stance that questions society and the status quo rather than upholding worn out political ideologies of exclusion and downright hatred. His stance has history in the Liberation Theology originating in South America where Priests rallied to overturn the status quo and give the poor preference in terms of rights and consideration. The years of the Church blindly backing the powers that be, were called into question and Liberation was pronounced in the name o the poor and dis-regarded. For those that want to get backup for why I think this way, just look at the Bible. Suffer the little children to come into me, when children were considered little more than property. In addition, look at the stories that include women in a very male society. Counter-cultural acts. I had a pastor tell me that if women were in the story at all, they were probably more involved than even the story implies or they would have been totally written out by the Church “fathers”. I have always and will always continue to repudiate the kind of “American Christianity” that defends the United States and its actions by claiming some sort of special relationship with God. This is totally wrong. At no time did Jesus ever preach a total giving over to the state. At most, he advocated proceeding to live ones life as called to live it regardless of what the state advocated. I don’t, for one minute, believe that a just and moving God loves a child born in the United States more than one born in Russia, as the religious right would try to imply. Mayor Pete does well when he calls that status quo form of Christianity into question. The fact of the matter is that this man has taken the political stage by storm. Moving from zero recognition in January to getting 11 percent of the straw vote in a poll in Iowa. He came in at third place and ahead of people like Cory Booker, and I believe Kamala Harris. He is not doing badly. If I had any complaint at all about him, it might be that he is not as outspoken as AOC or some of the other young turks involved in the political scene now. But that very politeness means that he just mind be able to get people on bord that the more outspoken would not. I( think it is telling that Obama and Bernie are two of his role models. Both of those individuals were proponents of change and hope for those that for too long have lacked hope in the current status quo. If Mayor Pete perfect? No, I am sure he isn’t, and if elected he will likely do things that I may disagree with. But then Obama was more Bush-lite than I wanted him to be. I wanted him to pull out of Iraq totally and he didn’t quite make it. On the other hand, he reached out to the DREAMERs, who were brought into this country by their parents and offered an eventual path to citizen. That was the right thing to do, without question. The point is, NO candidate is perfect, but Mayor Pete is young, a selling point as far as I am concerned….gosh knows my generation has sold out despite the Peace movement of my youth. Our hope at this point is the young, of who this guy is a prime example. I hope this guy goes far....we need actual hope for all in this country. Anyone that takes the country in the most opposite direction to where it is heading right now is okay by me, regardless of their gender, color, race, creed or sexual preference. Mayor Pete sounds 1000 times more sane and more intelligent than that orange creep that is squatting in the White House right now!!! Actually when you think about it, being 1000 times better than trump isn't a very high bar, but anything even Donald Duck would be better. But I would get a kick out of Pete winning for more thsn one reason, as you would suspect. Yeah he is one of the ones I want to be shocked..